Whether a performer or band manager, getting gigs can be a hard job. Between finding the right venue for your audience and negotiating the right fee, it can be a difficult process. Gigging is a great way to get your music out there and grow your fan base, so how do you go about getting gigs? People want to know not only how good you sound, but what kind of music you play and whether this will suit their venue. An electronic press kit is a must for anyone seeking exposure and publicity as an artist. The EPK is your professional resume to the music industry. JMC Contemporary Music Performance tutor Travis New mentions how “EPK should include professional quality studio recording as well as high quality footage/recording of the band live. I would only include the current single (audio/film clip) and the best live song you have footage/recordings of on the EPK with a link to the band website for additional content. Why not also include professional photos, quotes from industry professionals that can say good things about your work and perhaps other upcoming gigs you have booked. Find out where bands with a similar genre to yourself play, and send them your demo. Sending out demos can take a lot of time and potentially cost a lot too if you’re sending out raw CD’s, so knowing which venues are more likely to want your music to play, can be both time efficient and cost effective. If you have a strong following on social media, it may be more likely the venue will accept you to perform as they know they will get some good exposure from your fans. This also helps when it comes to cross- collaboration, if you can promote the venue through your social, they will be more likely to have you play. Try using websites such as Gigfinder or Sonicbids to locate and promote gigs. This is vital in most industries, but especially so in the music business. Make connections, shake hands, get contact details and keep in touch. Travis argues that “Networking is EXTREMELY important part of the music industry. The best way to meet industry people and other bands/musicians is to go out to gigs and be a part of the scene and build relationships in person. This goes without saying really, but the better you perform, the more likely people are going to want to hear you again, recommend you to another venue, or rebook you. It doesn’t matter what size venue you’re at, or if not many people have attended, take every chance you get to show off your talent to the best of your ability. Preparation is key. Be ready for your big opportunity. There are many aspects to this ranging from the music, the performance, your equipment, communication with venue/production staff/management/artist. Be prepared and be professional always. You never know who is watching. 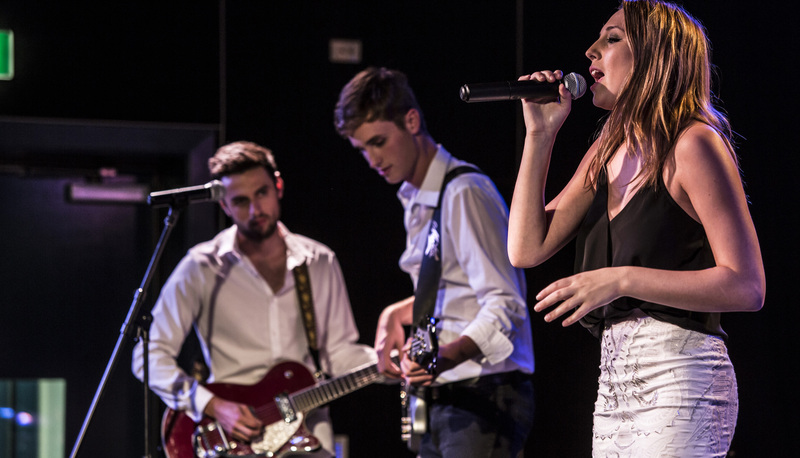 Find out more about studying Music or Entertainment Business Management at JMC Academy.